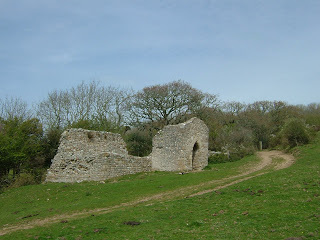 The ruined chapel of St Gabriel's stands (or sits or lies, depending on your point of view) at the foot of Golden Cap on Dorset's Jurassic Coast and beside the South West Coast Path between Charmouth and Eype. It is at the heart of the ancient settlement of Stanton St. Gabriel. But the ancient track (linking Chideock and Charmouth via the coastal farms of Gabriel's, Upcot, Ridge, Westhay and Stonebarrow) didn't run that way. It runs between the hedgerows behind the chapel, lost in thickets of bramble and elder and now a stream underfoot. Already there is a sense that this place is not what it seems. Much has been written and said about the history of Stanton St. Gabriel - known as one of the 'deserted villages' of Dorset. This website is dedicated to unearthing and recording some of the histories of the place. Then you'll also find a growing collection of texts and images relating to the site, which will be published as Absence: Histories of Stanton St. Gabriel in 2015.